Next Monday night, Common Cause in Wisconsin will bring together Eau Claire-area State Legislators and Wisconsin citizens at a free public forum at the University of Wisconsin-Eau Claire. The event will run from 6:30 to 8 PM and will include a lengthy Q&A with the audience. With the adjournment on April 1st of the 2013-2014 session of the Wisconsin Legislature, CC/WI invited all of the legislators from the Eau Claire area to UWEC to be panelists at a political reform forum. State Representatives Dana Wachs (D-Eau Claire) and Chris Danou (D-Trempealeau) and State Senator Kathleen Vinehout (D-Alma) accepted our invitation and will be panelists, along with CC/WI Director Jay Heck. State Representatives Kathy Bernier (R-Chippewa Falls), Tom Larson (R-Colfax), and Warren Petryk (R-Eleva) and State Senator Terry Moulton (R-Chippewa Falls) all either declined CC/WI’s invitation or failed to respond. Citizens from Eau Claire and surrounding communities are urged to attend this issues forum. In 2011, Wisconsin experienced the most secretive, partisan and expensive (over $2 million) redistricting process in state history – resulting in dramatically less competitive State Legislative and Congressional districts. We'll talk about why a measure that takes redistricting out of the hands of partisan legislators and puts that process into the hands of a non-partisan entity should be put into place as soon as possible – for the next redistricting process that will occur in 2021. We will also discuss Wisconsin’s 2011 photo voter ID law – one of the most extreme and restrictive such measures in the nation. It has been blocked by the courts, but will likely return in a new form soon. Is requiring a photo ID at the polls needed? Is there really voter fraud or is this a voter suppression measure? We will also talk about other voting restrictions that were rammed through the Legislature in March at the end of the 2013-2014 legislative session. We will also talk about the fact that tens of millions of dollars were spent by outside interest groups on largely negative advertising leading up to the 2012 recall and general elections. But the citizens of Wisconsin are still in the dark about who was really behind much of this avalanche of “outside” campaign cash and the constant barrage of special interest group “phony issue ads” during those elections. Panelists and audience members will explore whether this lack of disclosure of these anonymous communications is a form of protected "free speech" – or if citizens should have the right to know who is trying to influence their vote. And, we will look at the U.S. Supreme Court’s disastrous 2010 decision Citizens United vs Federal Election Commission which allows corporations, labor unions and other interest groups (and their "Super PACs") to use unlimited money from their general treasury coffers to flood our airwaves with negative messages, giving them far greater influence on the outcome of elections. How has the Citizens United decision affected Wisconsin and does it matter? These and other vital reform issues will be the focus of discussion this coming Monday, April 7th from 6:30 to 8pm at UW-Eau Claire in Hibbard Humanities Hall (Room 102). 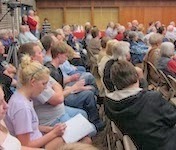 This event is the latest in CC/WI's continuing series of "reform forums" around Wisconsin. As noted earlier, the panelists will be State Representatives Dana Wachs (D-Eau Claire) and Chris Danou (D-Trempealeau), State Senator Kathleen Vinehout (D-Alma) and CC/WI executive director Jay Heck. And if any of the Republican legislators decide to attend between now and then, they will be welcome as panelists too. Political Science Professor Rodd Freitag of UW-Eau Claire will moderate the event. For all of the details about this forum, go here. The event is free and you are encouraged to attend and participate! Looking forward to this. Thank you for holding these forums. fyi congratulations to Dem Senators Erpenbach&Cullen and GOP Senator Schultz for their passionate and articulate remarks in favor of a non partisan districting plan! I'm concerned about the lack of participation of GOP Senators at these reform panels. Are they afraid of their leadership's reaction or do they just not care about fair and equitable voting systems in this state? Former GOP Senator Kapanke from our area participated in a La Crosse area forum a few years back but it seems lately only the Dems seem interested in election reform bills? I am nominally a Republican voter but I'm beginning to have doubts because of their efforts to restrict voting opportunities and expand opportunities to get more lobbying money into an election system already flooded with it? !